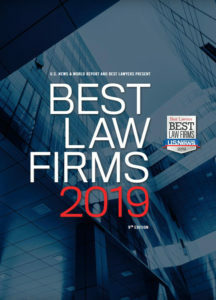 November 1st, 2018 – Thomas, Thomas & Hafer, LLP is listed in the 2019 U.S. News & World Report and Best Lawyers annual “Best Law Firms” rankings. For more on their rigorous selection process click here. Harrisburg, PA – August 29th, 2018 – Thomas, Thomas & Hafer is pleased to announce the recognition of six attorneys listed in U.S. News & World Report’s edition of The Best Lawyers in America© 2019. Several lawyers from Thomas, Thomas & Hafer LLP were listed in the 2018 listing of Super Lawyers. Super Lawyers is a rating service of outstanding lawyers from more than 70 practice areas who have attained a high-degree of peer recognition and professional achievement. The selection process is multi-phased and includes independent research, peer nominations and peer evaluations. Click here to learn more about the rating system. Pennsylvania Defense Institute Honors Thomas, Thomas & Hafer LLP as Defense Firm of 2017. July 14th, 2017 – Thomas, Thomas & Hafer LLP was recognized by Pennsylvania Defense Institute (PDI) as the “Defense Firm of the Year.” The award was given at PDI’s Annual Conference held in Bedford Springs, PA on July 13-14, 2017. Accepting the award on behalf of the firm were partners from four of the firm’s Pennsylvania offices: Pete Speaker, past president of PDI (Harrisburg office); Rebecca Sember Izsak, Co-Chair of the Trucking & Transportation Committee (Pittsburgh office); Monica O’Neil, Director for the Eastern Region and incoming Secretary (Philadelphia office); Lou Long, outgoing president of PDI and Co-Chair of the Amicus and Appellate Committee (Pittsburgh office); and, Joe Holko, Co-Chair of the Civil Practice Committee (Lehigh Valley office).